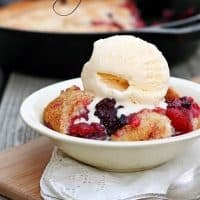 It is so handy to have a dessert like this Easy Fruit Cobbler in your repertoire. And let me tell you, dessert doesn’t get much easier than this. Berries are my personal favorite. Or maybe apples….its so hard to say. You can use frozen fruit in this recipe, but you may need to increase the baking time by about 5 minutes. 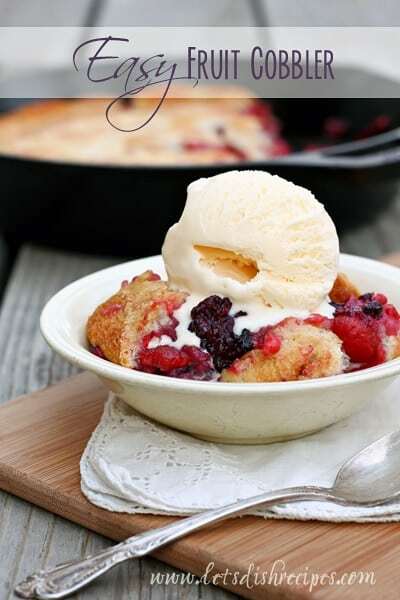 It’s delicious served warm with a scoop of vanilla ice cream or a dollop of homemade whipped cream. Put butter in an 8 or 9-inch square pan and place in oven. When butter has melted, remove pan from oven. Whisk flour, 3/4 cup of sugar, baking powder and salt in small bowl. Add milk and stir to form a smooth batter. Pour batter into pan, then scatter fruit over batter. Sprinkle with the remaining 1 tablespoon of sugar. Bake until the batter browns and the fruit bubbles, about 45-50 minutes. How amazingly delicious this looks!!! !